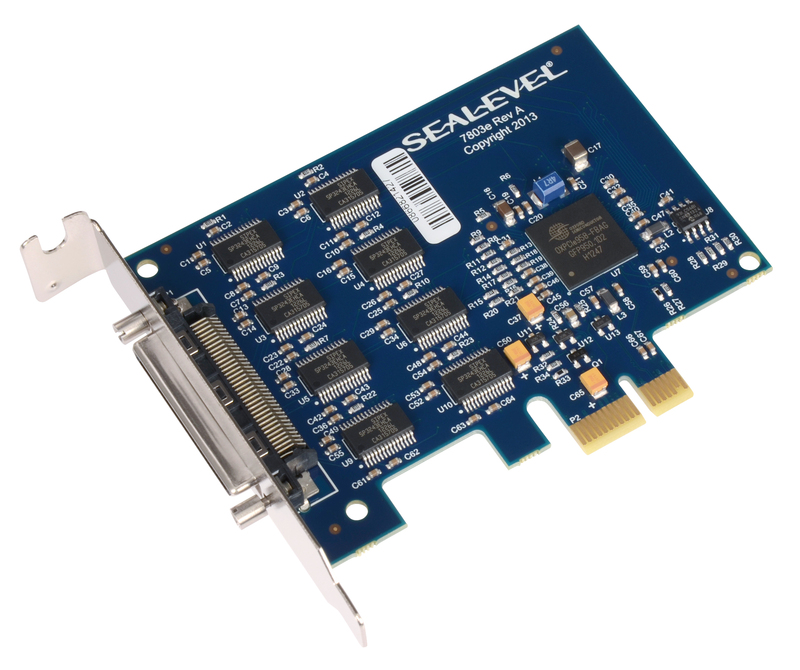 Sealevel Systems announces the 7803e, a new low-profile eight port RS-232 PCI Express serial interface adapter with advanced UART architecture. For maximum compatibility with a wide range of serial peripherals, the board supports all RS-232 modem control signals making it a perfect solution for interfacing to a wide range of peripherals. The 7803e's serial ports utilize 16C954 UARTs with 128-byte Tx/Rx FIFOs that enables data rates to 921.6K bps for reliable high-speed communications in data intensive applications. This high-performance UART includes 9-bit framing support and is fully software compatible with legacy 16550 applications. In addition, the board derives a 62.5 MHz clock from the PCI Express link. This ultra-high speed clock is divided by a flexible 8-bit clock prescalar with 1/8 steps to provide support for the widest range of standard and non-standard baud rates. All Sealevel PCI Express serial adapters include SeaCOM software for Windows and Linux operating systems. For easy installation and troubleshooting, customers also receive WinSSD, a full-featured application for testing and diagnostics including BERT (Bit Error Rate Testing), throughput monitoring, loopback tests, and test pattern message transmissions. The 7803e is available immediately from stock priced at $449 for low-profile (Item# 7803e) and full-height (Item# 7803eS) PCI Express slots. Both items ship with a 36 inch cable that terminates to eight DB25M connectors. Both boards are also available with a 36 inch cable that includes eight DB9M connectors. Standard operating temperature range is 0 - +70°C (extended temperature versions operating from -40°C - +85°C are available). Like all Sealevel I/O products, the 7803e is backed by a lifetime warranty.